I am happy to report to you all that we finished our 13th RAU Leadership retreat with a second group of leaders from the upper northeastern part of the Democratic Republic of Congo. The northeastern D.R. Congo borders South Sudan, Central Africa Republic as well as northwestern Uganda. 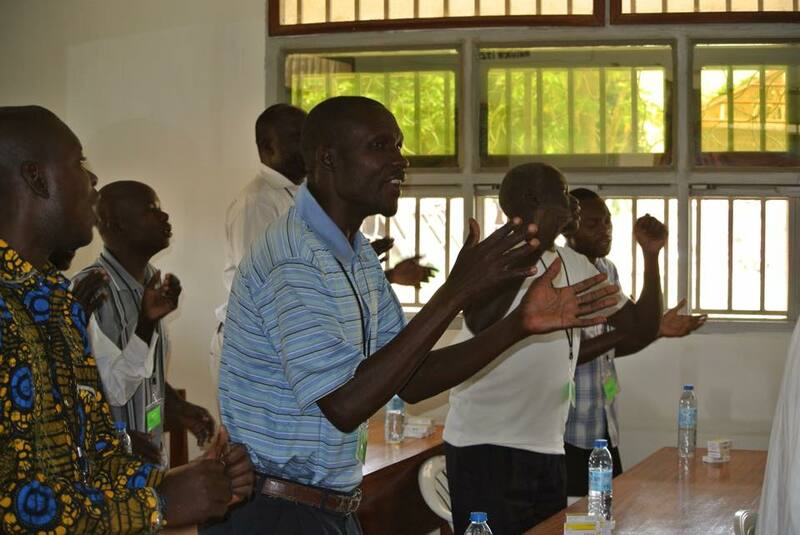 The Guesthouse veranda was often full of joyful laughter and animated talk in Lingala, Kakwa, Swahili, Madi, French, and English throughout the four days the pastors were with us. We also found out that the Congolese are gifted singers. 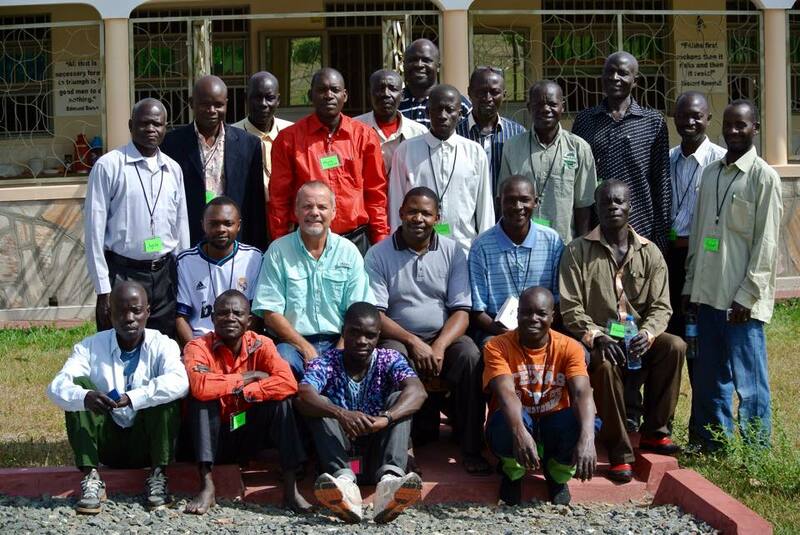 It was an honor to study together with this small group of 17 men who are on the front lines proclaiming the gospel where there are few or no churches. 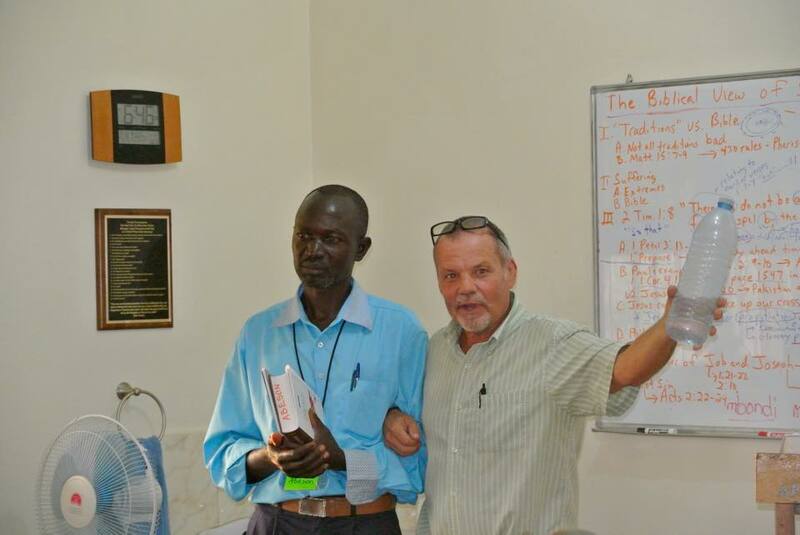 Your prayers and support are a vital part of us walking out 2 Timothy 2:2 here at Reaching Africa’s Unreached! We had many good and intense discussions on what exactly the gospel is and the importance of understanding that salvation is by grace alone through Jesus alone (with theme of 2 Timothy 2:2 echoing throughout the Hall of Tyrannus all four days.) 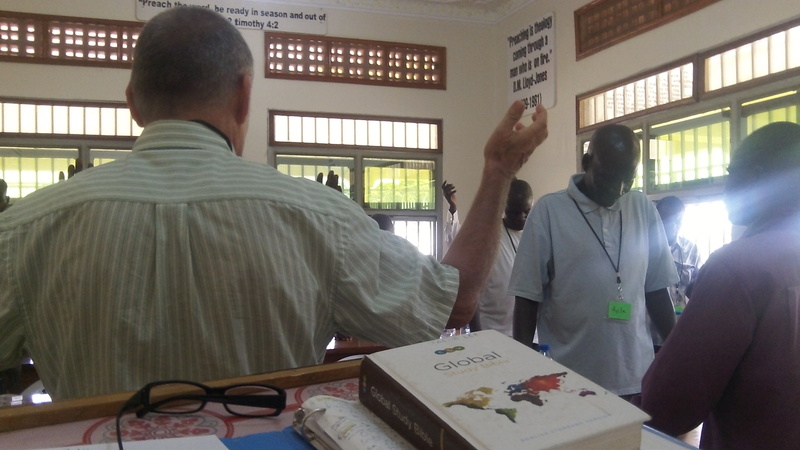 Pastor Patrick and I did the bulk of the teaching with intern, Zorah, taking one session. As I spent more and more time with these men my love for them grew. I greatly respect them as they labor in a very challenging part of the D.R. Congo. Their stories reveal the great love of Jesus for them and their great love for Him. 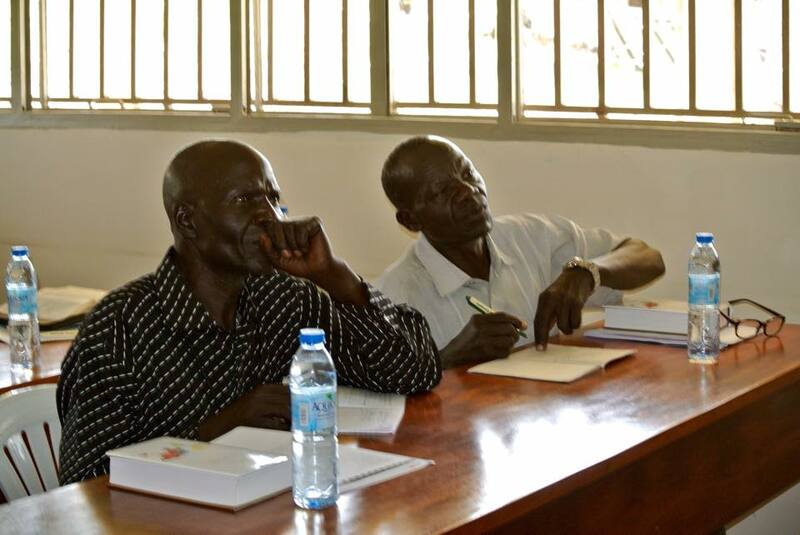 Each pastor received an ESV Study Bible and was taught how to use it. 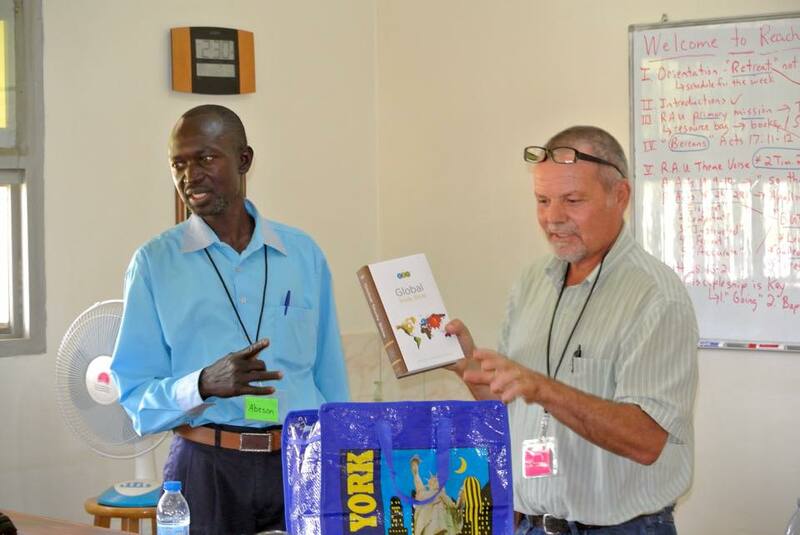 Pastors receive a bag full of rich resources. 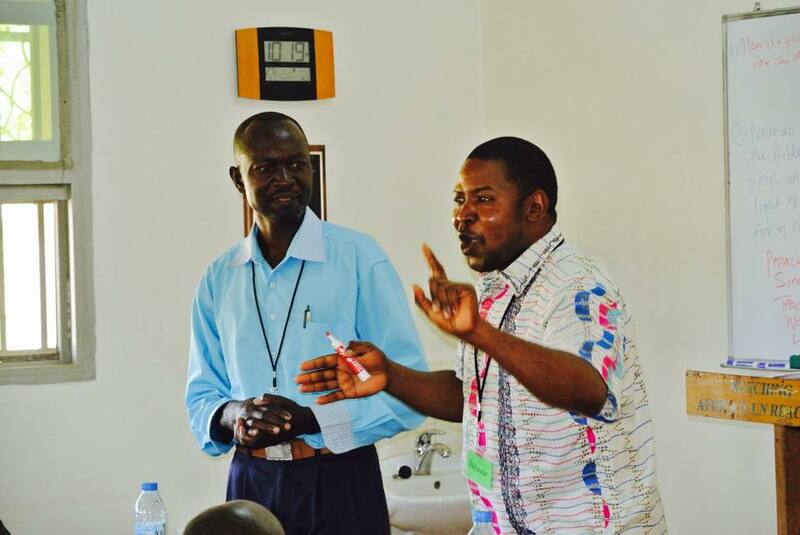 Many possibilities are present to train leaders in their region that the fame of King Jesus would spread throughout their heavily forested area. I am told the terrain in their region is in itself challenging. We are in the process of working to get three more groups to RAU from their area and to travel there at least twice for leadership training before the end of the year. Lord willing, we will be able to accomplish this goal. Please pray that strategies can be successfully made and implemented. 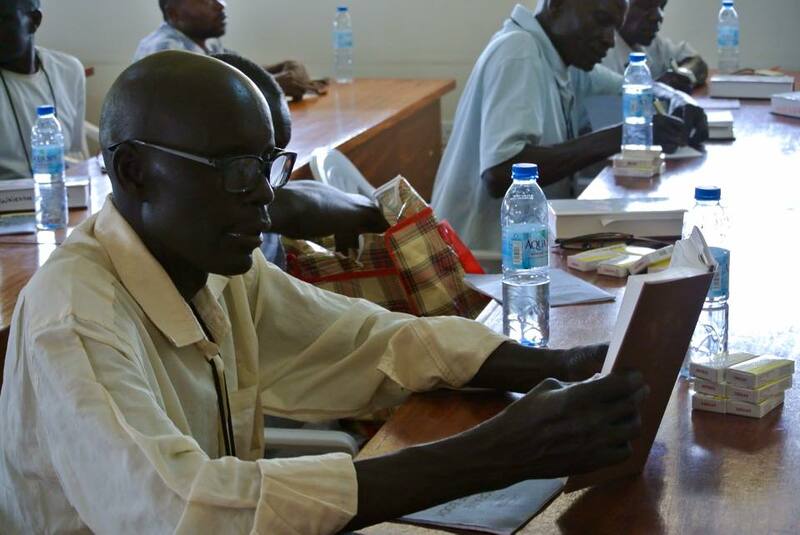 Pastors also received reading glasses if needed as well as de-worming pills for themselves and their families. Carol attended to many other medical requests. 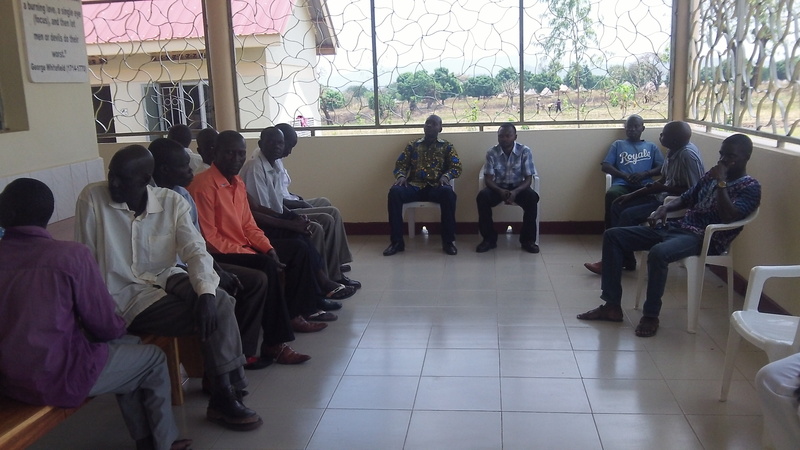 During our testimony time a Congolese pastor said 99% of their pastors have received NO education (Biblical instruction.) After his testimony I asked the rest the pastors if this could be true and they quickly said in unison, “YES”! They also said pastors have no biblical resources to help them shepherd their flocks. My heart was broken and I write now with a deep burden in my soul for them and many other shepherds in this region of the world. I have been pondering what Adoniram Judson, Missionary to Burma (1788 – 1850), once said and I pray that each day I will seek to spread the fame of King Jesus where there is famine of people worshiping Him with all their hearts, souls, minds, and strength! Thank you for your participation in this! 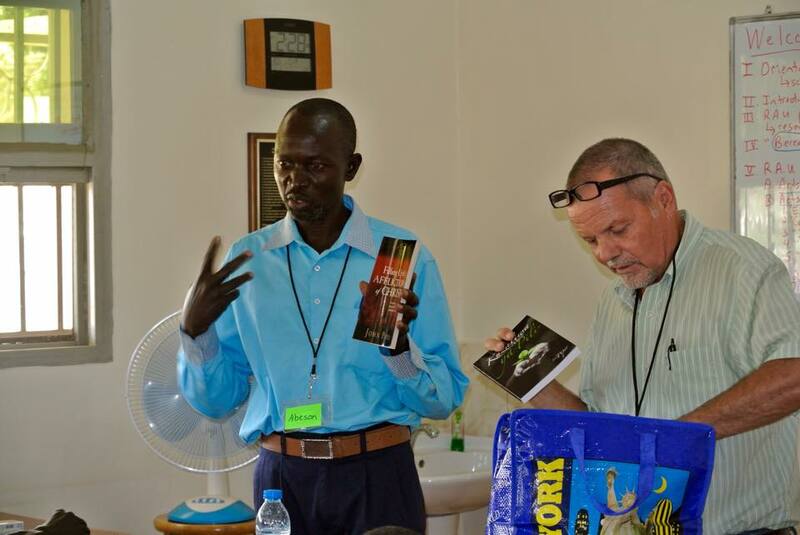 At the retreat, along with teaching from Pastor Patrick, Zorah and me, the leaders received ESV Global Study Bibles and other solid biblical resources. 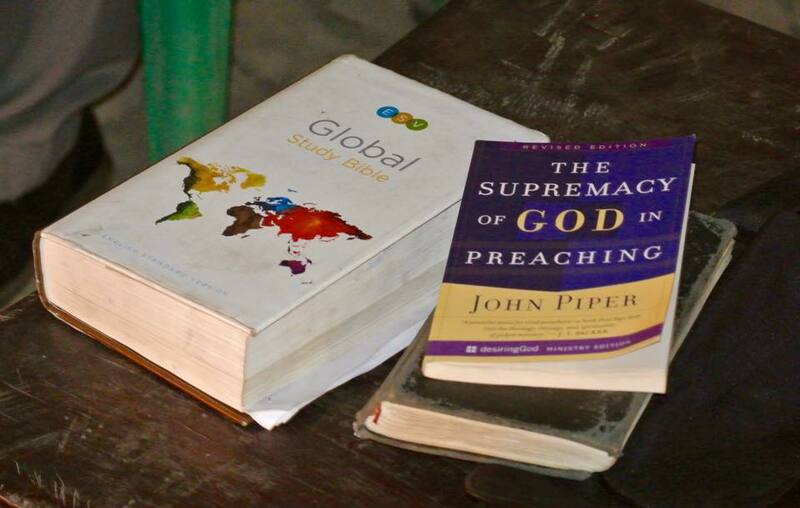 Because of donated books through the Gospel Coalition International Outreach these Congolese pastors also received supplies in French and Swahili with their materials in English. 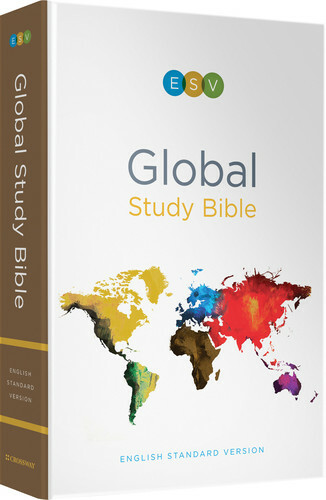 The ESV Global Study Bible is a resource that pastors treasure and use. By the grace of God in and through us all we can take part in equipping pastors, thereby lowering that “99%” figure! 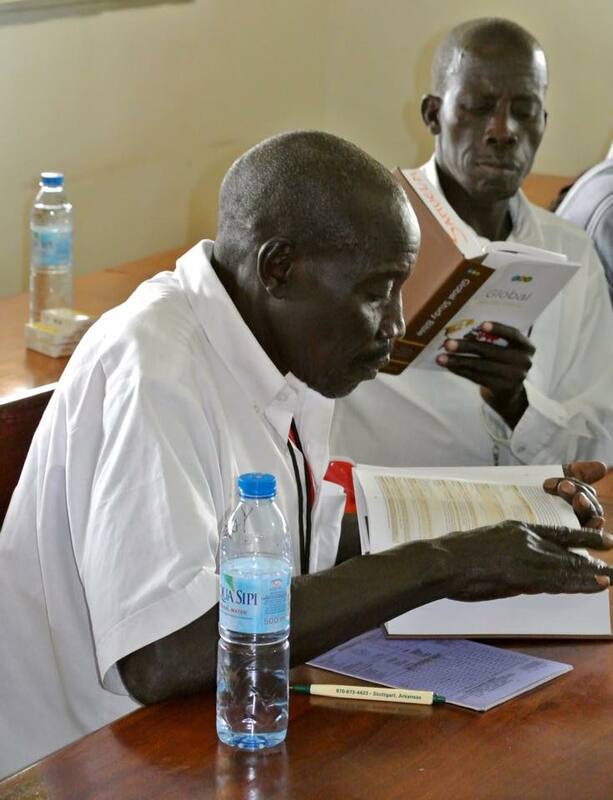 We now have funds for a little over 2,000 of the 5,000 ESV Global Study Bibles we hope to see in the container coming to Reaching Africa’s Unreached and which will be freely placed in the hands of church leaders in the West Nile region of Uganda, Southwestern South Sudan, and Northeastern D.R. Congo. Pray that we can reach the 5,000 number sooner rather than later as supplies are running low. Can you help us do that? 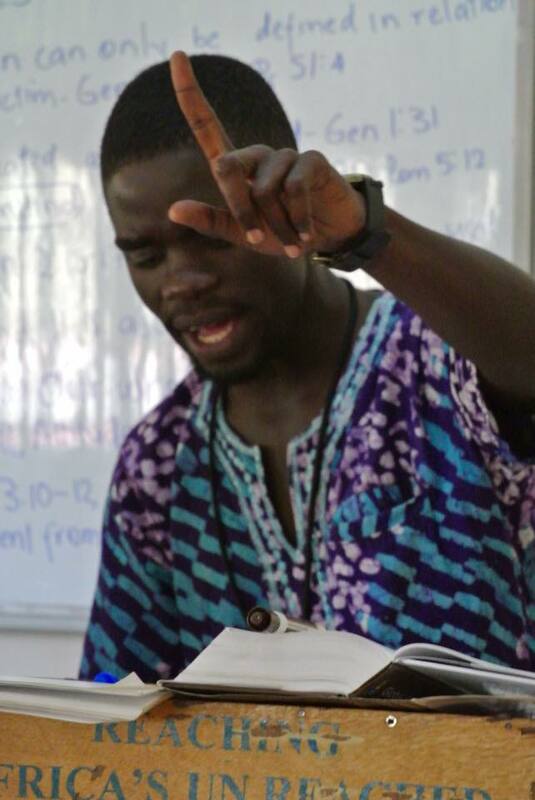 More information can be found at our website ( https://reachingafricasunreached.org/fill-the-container-study-bibles-books-and-more/ ).